If you are in an area that cannot receive clear regional TV pictures from a TV antenna. We can provide you with the complete range of Digital channels via Satellite including local news and High Definition channels. Our Viewer Access Satellite Television “VAST” system provides digital television to viewers who are unable to receive digital TV through a normal antenna because of local interference, terrain or distance from the transmitter in your area. 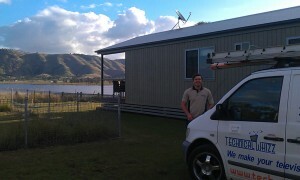 This system is also ideal for travellers intending to travel around Australia in caravans and Motor homes. A standard system requires a small satellite dish, digital cabling and a licenced VAST Satellite receiver connected to each television. There are three brands of receivers in the domestic market. Altech UEC, Satking and Humax. 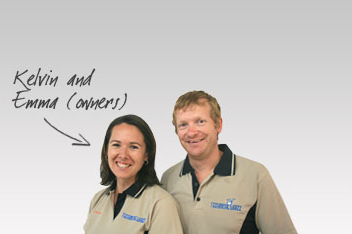 All brands have a recording option, Digital radio Stations, and on screen TV guides. Once installed there are no ongoing licensing fees, We do all the paperwork for getting your licence approved and your VAST system activated. For travellers, users of an active Aurora system, or you live in the remote central Australia or Eastern Australian licenced area activations occur within 24 hours. Viewers in regional and metropolitan areas served by normal terrestrial TV services but who are unable to receive reliable digital TV activations take 15 working days. Travellers are required to update your licence every 6 months via the internet or phone (no charges apply). Download a brochure or watch a brief overview on each of the models. Is Australia’s first VAST & Freeview Plus certified satellite TV receiver, making this unit the most advanced VAST receiver on the the market. 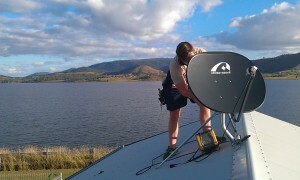 Fully designed in Australia this top of the range receiver brings a new level of features to the VAST platform. 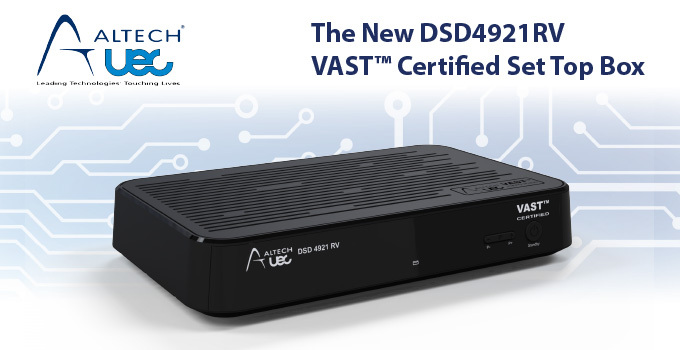 The UEC DSD 4921 RV is a “Next Generation” VAST™ Certified, Twin Tuner, High Definition, Digital Satellite Set Top Box. This product is packed with new technology, features and accessories, making it ideal for both the traveller and standard in home installation. The twin tuner configuration, plus suitable recording device, (not included) allows support for PVR functionality. UEC’s market leading hardware and software ensure the receiver is ‘future proof’ through using latest technology and over the air software upgrade. The hardware is designed to withstand the harsh Australian environment that recreational vehicles are likely to experience including high temperatures, DC over voltage, reverse polarity and short circuit protection. All of these class leading features are housed in the smallest VAST™ receiver on the market, making it the perfect solution for Caravan and RV enthusiasts wanting to watch and record their favorite programs whilst traveling. Each DSD 4921 RV product is supplied with: 240V AC wall mount power supply, 12V DC power cord & Aux connector for easy RV installation, HDMI plus 3x RCA Audio/Video cables, high quality remote control as well as a Remote-TV-Eye extender for installation in units or cabinets. The DSD 4921 RV is Hybrid Broadband TV (HbbTV) ready with all key software features to support Freeview Plus once available on the VAST™ platform. 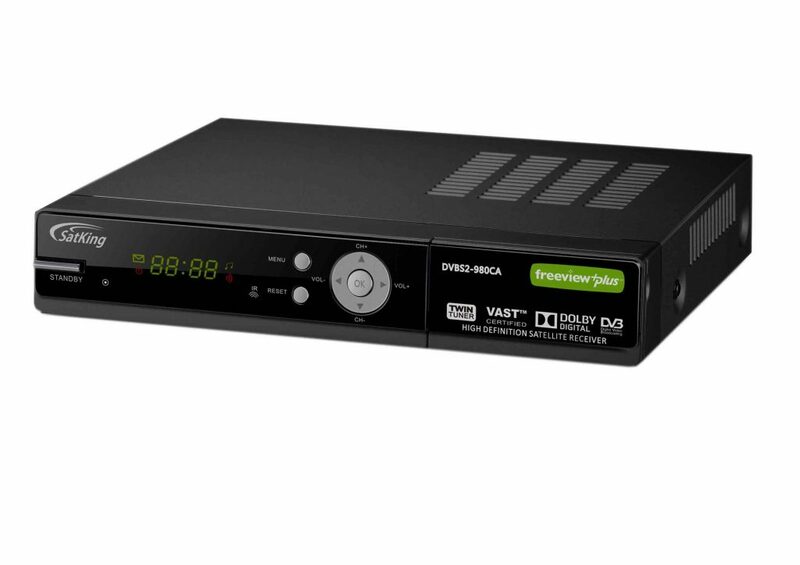 You may need a decoder rehit If you have not had services on your VAST Decoder for a period of time setup your dish correctly so you can get channel 800 then click on the link Decoder ReHit .